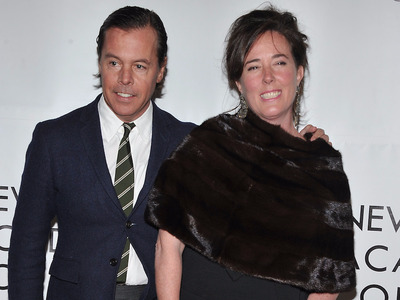 Getty/Theo WargoKate Spade with her husband, Andy. Andy Spade was a cocreator of Kate Spade’s namesake brand and played an integral role in building the business. “Kate suffered from depression and anxiety for many years. She was actively seeking help and working closely with her doctors to treat her disease, one that takes far too many lives. We were in touch with her the night before and she sounded happy. There was no indication and no warning that she would do this. It was a complete shock. And it clearly wasn’t her. There were personal demons she was battling,” he said. “This is the truth. Anything else that is out there right now is false,” he said. “It was over family problems … in her relationship,” a NYPD source told the Post, referring to the contents of the note. “The reason I started making handbags was because of Andy’s suggestion. After moving through a number of positions, I had been promoted to senior fashion editor after six years at Mademoiselle magazine. I wasn’t sure the next step was one I wanted to make. Andy just said, ‘You know, I think we should start something,'” Kate Spade told CNN Money in 2003. The business was named after the couple’s combined names. The couple built up the brand over the next few years before selling a 56% stake to Neiman Marcus for $US33.6 million in 1999. In 2006 they sold Neiman Marcus the remaining stake for $US59 million. One week later, Neiman Marcus went on to sell the business for $US124 million to retailer Liz Claiborne. Coach acquired the company last year for $US2.4 billion. The couple didn’t give up on handbags altogether, though. In 2015 they launched a new brand, Frances Valentine, that sells shoes and handbags. The company was named after their daughter.